Bond Economics: Bubble Or Business As Usual? Bubble Or Business As Usual? I have seen a fair amount of commentary arguing that the Fed is fostering a bubble or “financial imbalances” (as cited by the dissent of Esther L. George in the FOMC statement) with its policy of Quantitative Easing, Although the price movements of risk assets (the stock market and corporate bond spreads) may appear crazy and bubble-like, they are only following a pattern of behaviour that has been in place for decades. The fixation on the size of the Fed’s balance sheet is just the latest excuse that strategists have latched onto to explain price action that probably was going to happen anyway. A relatively steady upward march, with a few intermittent dips that rapidly reverse (green arrows). Hence “buy the dips” remains popular advice in financial folklore. 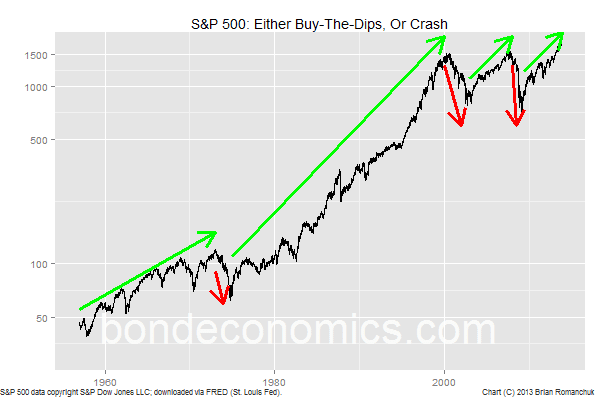 Occasional crashes that do serious damage to equity returns; typically associated with financial crises (red arrows. Note that I have not added red arrows for some episodes, like the 1987 crash, in order to keep the chart clearer.) Bulls who "buy the dip" too early here get crushed, adding to investor panic. We are currently in an upward march phase, and the bears are being steadily squeezed. Hence, the widespread complaints of there being a “bubble”. But that is exactly what has happened during every other bull market, so this is only news if you focus on short-term noise and ignore longer-term trends. This stock market behaviour may seem strange, but it actually reflects the weak form of market efficiency (which says that it is difficult to beat the market; I do not think that the markets have other mystical properties that are associated with market efficiency). During a bull market, bulls will outperform bears. Realised credit losses are low, partially because refinancing is readily available, even for the dodgiest borrowers (“a rolling loan gathers no loss”). Investors that apply leverage to their portfolios of risk assets will handily outperform their more conservative peers. This creates a natural selection effect, with the assets under management by the bulls growing much faster than assets managed by conservative investors (either due to the higher returns, “career risk” among the bears, or performance chasing by investors). This process continues until there is a critical mass of over-extended bulls. Once this occurs, almost any disturbance will force liquidation of positions, but with most investors now on the same side of the trade, pandemonium results. In many crises, it has taken direct intervention by central banks to put a floor under asset prices. The reason why I view this as being an example of weak-form “market efficiency” – despite the fact that this behaviour is arguably crazy – is that this pattern of pricing cannot be beaten by investors in aggregate. If investors attempted to beat this cycle by keeping prices less volatile through the cycle, the performance by renegade investors who applied leverage to their portfolios will look even better (higher returns, low volatility). This state of affairs will continue until the bulls have regained the majority control of assets, and then cause a crash when they get overextended. A small investor could conceivably be able to read the cycle and time the market to get excess returns, but investors in aggregate cannot. This financial market behaviour overlays a very similar dynamic that occurs in the real economy. Firms that expand using leverage will gain market share during the expansion at the expense of their more conservatively managed peers. Thus the real economy also has a selection mechanic that favors the use of leverage by firms. The financial market behaviour reinforces this real economy trend, to the point that financial market instability is now a major driver of real economy instability. I associate this mode of analysis most closely with the work of economist Hyman Minsky, although the original source was Keynes’ views on the business cycle. This article by Randall Wray discusses Misky’s thoughts on the evolution of finance from near the end of his life in the early 1990s. Minsky argued that the instability created by the Savings and Loan Crisis was not just the result of deregulation; the changes seen in finance were a reflection of forces that are internal to capitalism (what I refer to here as “natural selection”). It is fairly easy to justify a rally in risk assets right now. Global holdings of financial assets are dominated by institutional investors and/or individuals who face considerable pressure to meet post-retirement cash flows. Government bonds offer yields that are far below the returns desired to meet those actuarial needs. Meanwhile, equities offer much higher long-term expected returns than government bonds under almost all the assumptions for future earnings growth used by investors. Corporate bond spreads may be low, but they are still positive, and realised defaults will probably be small as long as the cycle does not turn. Additionally, corporate profits are high and cash distributed to investors largely ends up being reinvested in risk assets. This creates the “melt-up” dynamic that we are seeing. However, this explanation does not satisfy most strategists, as it does not explain why equities have had their bear markets since the mid-1990’s (since the same factors were in place then), nor are there indicators that measure how overextended investors are (the details only emerge in the crisis post-mortem). Thus they seize on whatever justification they can find to explain the rally; in the current cycle, it is allegedly the Fed driving the cycle. However, I argue that it has historically been the case that it has been investor positioning that kills the cycle, not the level of Fed Funds (or the size of the Fed’s balance sheet). Given that I feel that this manic-depressive market behaviour is the result of forces inherent to capitalism, I do not see any easy way to moderate it. U.S. policymakers do not even have a good reading of the level of labour slack in the economy; it seems unlikely that they could hope to sensibly regulate the pricing of long-duration risk assets. Regulations could eliminate some of the worst excesses in High Frequency Trading, but regulations are not going to change the actuarial realities faced by institutional investors. Forcing underwriters to hold equity in securitisations they create will not restrain the behaviour of investment bankers that are bullish on asset prices. In other words, such regulations will just create a dynamic that the most gullible investment bankers will end up with the greatest market share. I do not see any major political party in the developed world endorsing the nationalisation of fixed asset investment, which was Keynes’ solution to the cyclicality induced by financial market speculation. In any event, such a move would probably just mean that recessions would be induced by government policy errors instead of being the result of private sector mistakes. As noted in the article by Randall Wray, if the economy is financed by conservative bank loan officers, the effect of the financial cycle could be reduced. Since traditional banks cannot get loans of their balance sheets, loan officers have to take into account potential downturns when extending financing. Therefore, returning to a traditional banking system, as was the case in the 1950’s, does seem like a solution. But as Minsky argued, this traditional banking system was replaced by “shadow banks” as the result of competitive pressures. It does not seem obvious that this evolution can be easily reversed.